Oh man, my friend Ryan sent me this awesome video tutorial of Medieval Madness. It's a great explanation of the game, and "Bowen" is obviously a world class player! He also does a great job narrating, explaining each move as he executes it. It's also just a really great camera set-up, directly over the board. I'm not sure why it's taken me this long to start reading the Tilt Warning Blog (where this tutorial was posted) but the blog is written by the people who run PAPA (Professional and Amateur Pinball Association) and they have an ever expanding page of such tutorials. Check them out! I know these are really going to help me up my game when I come across these pins in the wild. Spotted at the Quechee Antique Mall! 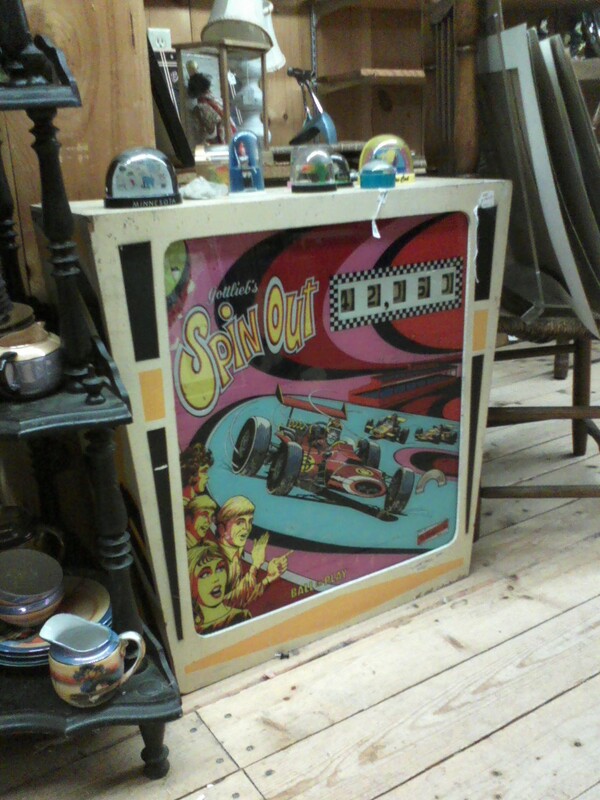 A few months ago, Claire and I were at the Quechee Antique Mall looking for christmas presents to give people and we came across this backbox from the 1975 Gottlieb game Spin Out. I can't remember the exact asking price, but it was something nuts like $500. It's always weird to see PART of a pinball machine like this. Where did the rest of it go??? Recently my girlfriend and I went on a vacation to Las Vegas. We needed to get away from White River Junction and its crippling winter. Las Vegas wasn't a steaming jacuzi, but it was warm enough! Neither of us had any intention of gambling more than $10 or so. We both planned to take advantage of all the free stuff that Vegas throws around to the poor people getting fleeced alive. Also, as I explained before, Vegas was a criminally cheap vacation to take. There was one other major factor to the decision to go to Vegas, though: the Pinball Hall of Fame. Tim Arnold has amassed a truely amazing collection of games. I'm getting ahead of myself, though. There were a couple of pinball machines that I encountered before me and my grilfirend took our legendary trip to the PHoF. First, within minutes of checking into our hotel, I discovered that the arcade had the Ripley's Believe It or Not, No Fear, White Water, and NBA Fastbreak machines! A nice little line up! The NBA Fastbreak game was super fun to play. I had never tried it before. 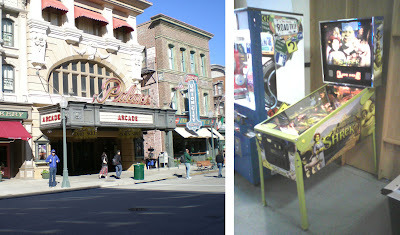 I had also never played Ripley's Believe It or Not, and I had a blast with it! Another great Stern game! Ugh...too bad. I also found a copy of Star Wars Episode 1 in Excalibur that played great, but didn't have the lightsaber! What does a guy have to do!? There was a Shrek and Family Guy in the Bellagio hotel, which was really funny to see side by side (they both have the same playfield, just different art). 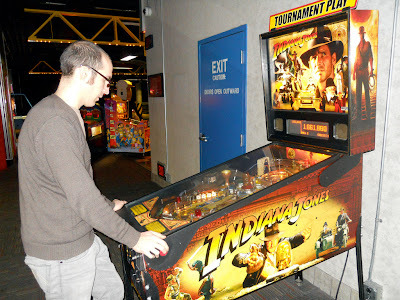 My girlfriend and I also had an epic couple of games on the new Stern Indiana Jones machine in the Sahara arcade. At first, I saw that the machine was pretty filthy and looked kinda gross, but I decided to go for it and WOW! The thing played like a dream! All of the shots felt really satisfying. Hitting that Ark and getting the huge multiball was completely off the hook. I was completely going bonkers! I love the matter-of-fact sign. "Prepare to replay, ye who enter here." I don't even know where to begin with describing this collection. It was huge. Here is the game list. There were a ton of games there that I have always wanted to try, but have never found out in the wilds including Black Hole, Haunted House, The Champion Pub, the Gottlieb Super Mario World, the new Stern Avatar, the Data East Star Wars, and Monster Bash. I'm barely scratching the surface of thegames I played, but needless to say that they were all in impecible order, and MANY replays were had! Every new Stern game was there, and there was a massive collection of Gottlieb wood rail games. There's nothing like playing some old EM games and hearing those chimes and bells! The crowning jewel of the hall of fame wasn't a machine, though, it was Time Arnold himself. Tim has put together an amazing collection with the help of his club members and works tirelessly to see that they are all clean and in perfect working order. 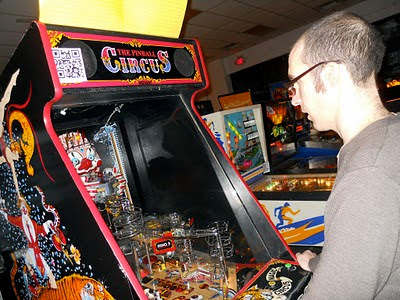 He was gracious enough to grant me an interview where he told me about the history of the Pinball Hall of Fame, a lot more about the collection, and a ton of other stuff about pinball! 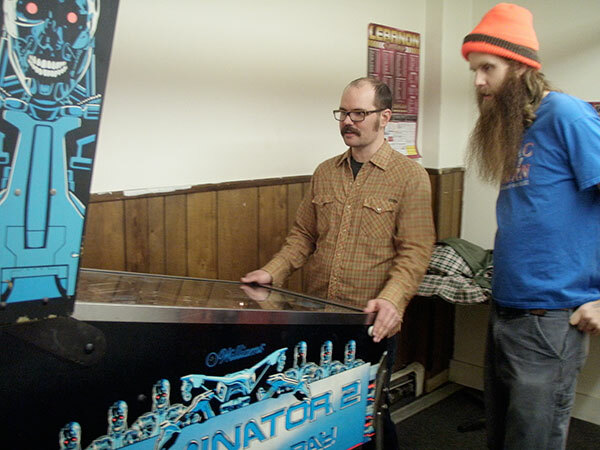 He's a real pinball genius and it was a real pleasure to get to talk to him. When I first approached him and introduced myself, I found him working on an extremely rare game called Pinball Circus. It was a completely innovative game that made it all the way through the design phase, but was never fully produced. Only THREE copies of the game exist and Tim Arnold has one!!! 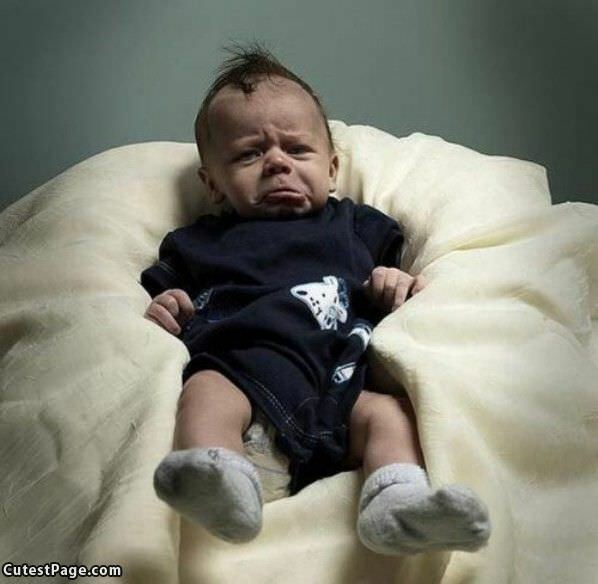 Me getting a replay, word. If you are EVER near Vegas and like pinball, you HAVE to check this place out. 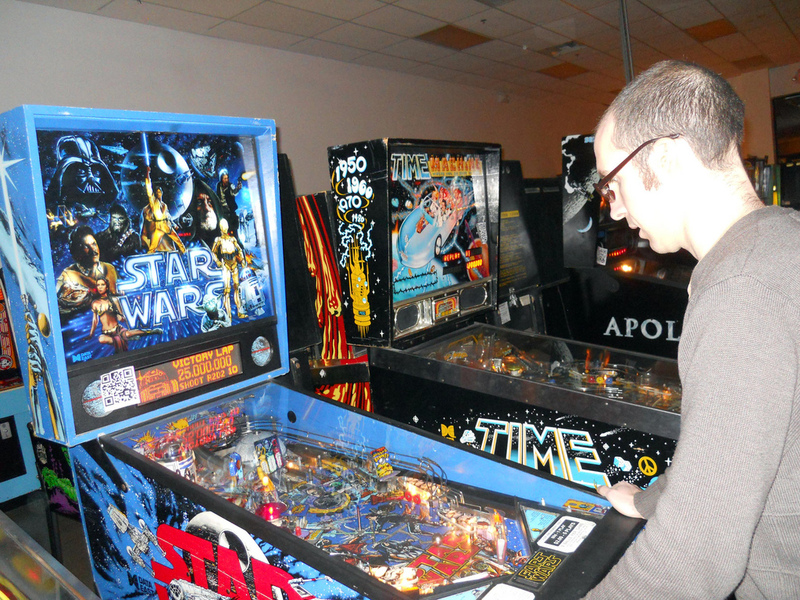 It is literally pinball heaven. A great place to play. Not only that, but Vegas is really cheap. They just kept giving us free drinks and shows, who would want to gamble!? The last thing I'd like to say is that I officially have a new favorite game: Cactus Canyon. I played it at the PHoF and I couldn't get enough of it. It's the coolest thing ever. There's a gold mine, a quick draw, a train. AHH! IT'S THE BEST!! Anybody got one! Wanna let me in on that hawt flipper action!? I can't believe I'd never heard of it until now, but it seems like it had pretty low production numbers, which is crazy because this game is beautiful. 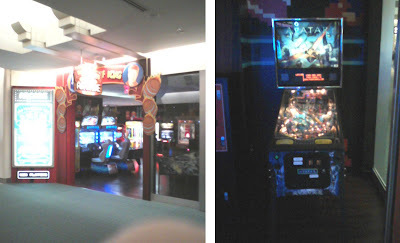 Pinball is alive and well in Florida! It has been pretty darn cold up here in Vermont lately, so last week Jon and I both took off for quick vacations to warmer locales. 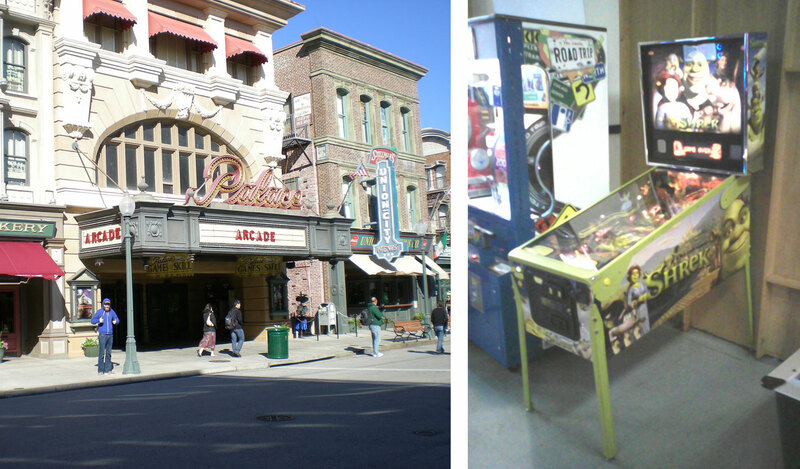 Jon will do a write up soon about his trip to Las Vegas, where he played A LOT of pinball, but for now I thought I'd do a quick wrap up of my trip to Florida and the pinball machines I played while I was there! The day before I left, Claire and I had to run some errands, including a trip to the post office at the top of the hill in White River Junction. While up there, we decided to swing by the bowling alley, to see if the Scared Stiff machine was fixed yet (last time I played it, I pulled the plunger back and it yanked right out of the machine!) I'm happy to report that the repair man has fixed this machine up nicely! Other than some GI problems in the upper playfield, it's looking great. I got three consecutive, escalating replays, which I took as a good sign for the upcoming trip! Claire and I were mostly going to Florida to visit Harry Potter land. Our hotel was about a mile from Universal Studios. 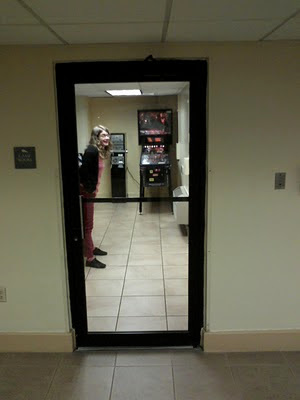 On our first night there I took a walk to a drugstore a few blocks away, and on my way back to the hotel I saw through a window into a tiny arcade right off of the lobby, with a T3 machine in it! The flippers were pretty weak, but I managed to squeak out a replay before going to bed. On our last night in town, Claire ran both ramps all the way up and then started a multiball during the "BIG POINTS" mode (or whatever it's called). She shattered my highest score, easily snagged the replay and ended with something like 32 million? Way to go Claire! 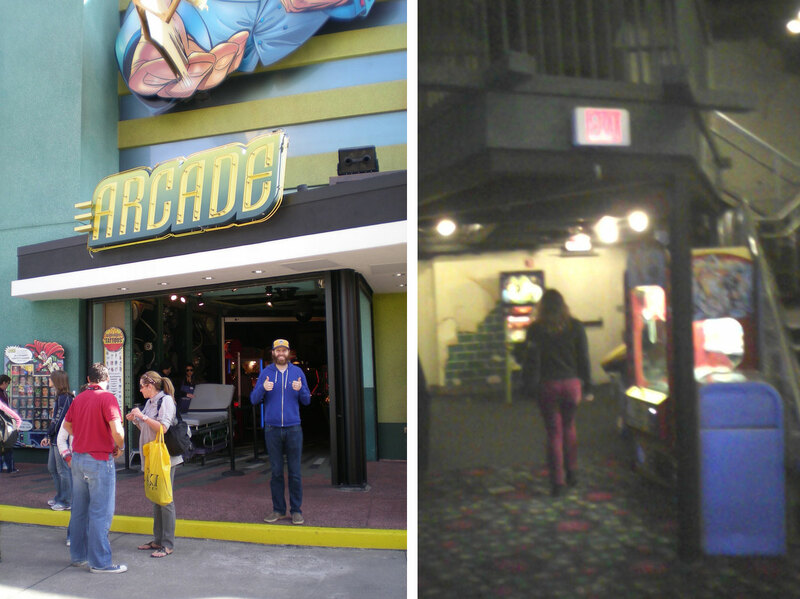 While walking around the "Islands of Adventure" park we came across a giant arcade! There was one Shrek machine tucked in the very back of the room, under a platform. It was in good working order and after a few games I got the replay. My game lasted a while and two other pinheads had lined up to play. Claire played my replay credit and then we let them use the machine. The next day we went to the regular "Universal Studios Florida" park, and while walking around the "New York" section we came across another arcade! The facade of this one was so cool, with a giant marquee. It must have been fun to go into a place like that back in the day. Sadly, they only had another Shrek machine, and the flippers were super weak and it was having some other switch problems as well. I still managed to squeak a replay out of it. It was actually pretty fun playing this game because we had watched the Shrek 4D movie that morning! That night I dragged Claire to a Chuck E Cheese that had a Pirates of the Caribbean pin, but it was totally busted. 10 credits sitting on it, but it couldn't even launch a ball. Drag... but our pinball adventures were not over yet! No, in the Orlando airport, I saw a sign for another arcade! Surprisingly, it was a King of Kong themed arcade, with a massive poster from the documentary and Donkey Kong wallpaper all over the interior and along the signage. Sadly, the place did NOT have Donkey Kong or any other vintage arcade games, which would have made sense. 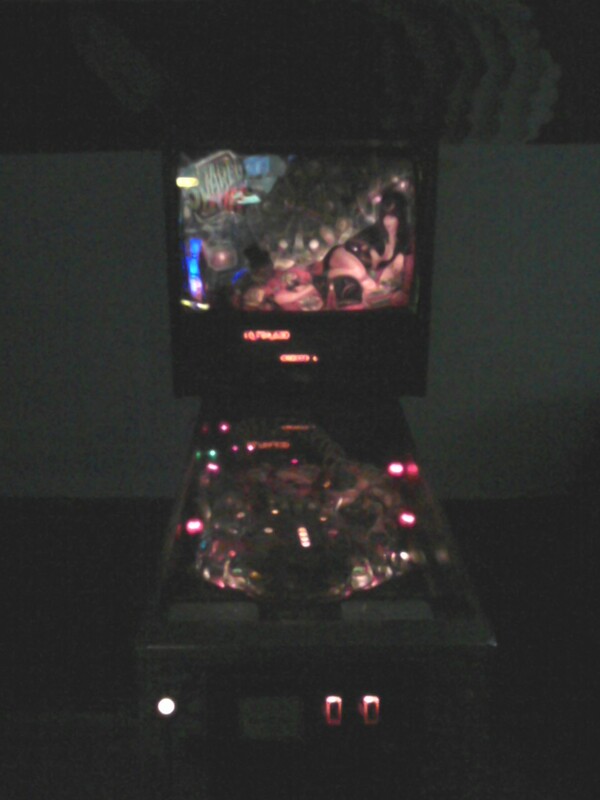 The only pinball machine they had was Avatar. I've played this pin three times now, in three different states and I think I can safely say, I do not enjoy the game. Too many toys, not enough ramps. It did not help that this particular machine was slanted about 5 degrees to the left. It also cost 75 cents for a credit. After many frustrating games, I finally started a two-ball multiball that I then turned into a 4-ball multiball, which resulted in a replay. The last credit was three balls down the left outlane, then we boarded our flight back to the cold Northeast. NEXT: Jon Chad's pinball adventures in Las Vegas!!! We're getting into a real ven diagram here about the things I love in life. I'm a HUGE fan of the Tokusatsu genre. It's a pretty broad genre, but all of the giant monster / mecha stuff really captured my heart as a kid. I loved Power Rangers, Ultraman, and Godzilla. The 1990's Godzilla movies were all really great (my favorite is Godzilla vs. Biollante) and I rented them from the video store at every chance I could get. In 1995, Godzilla vs. Destoroyah marked the end of the 90's Godzilla movies. There was a five year break before I found out that Tristar was planning to release a Godzilla movie. UGH. We all remember how sad that made us, right? Two years later, an honest-to-goodness TOHO Godzilla movie was release in theatres; Godzilla 2000. It was probably the single most exciting movie-theatre watching experienceof my childhood. 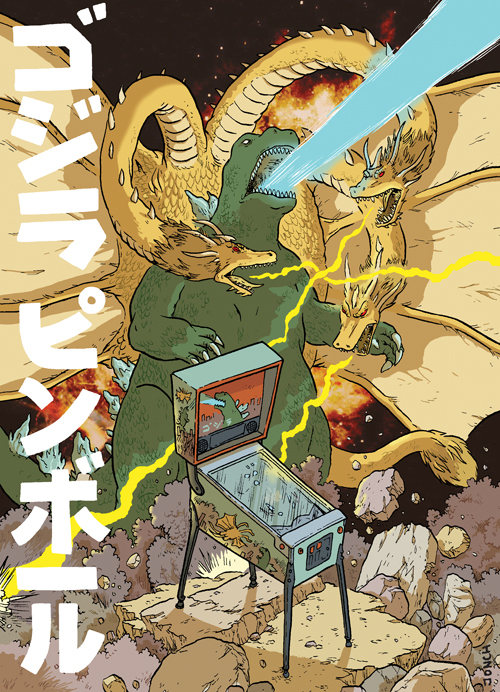 All this buildup is to say that there has never been a proper TOHO Godzilla pinball machine released (I'm not counting the Sega Godzilla machine since that was based on the Tristar Godzilla). I mean, talk about a machine that would design itself! All that destruction!? All those monsters!? 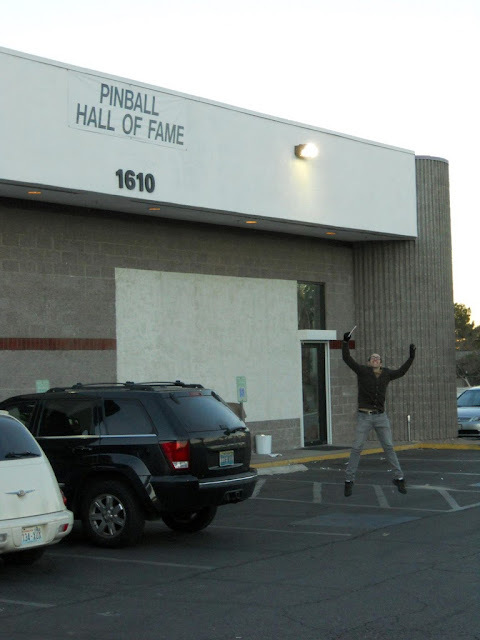 I leave tomorrow for my trip to Las Vegas with a planned stop at the Pinball Hall of Fame. I'm going to go in on my birthday! I can't think of a better way to celebrate the annual success of my continued survival! I'll try to post from the road! 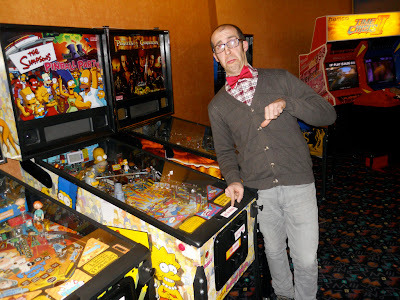 I can't remember if we have posted about these articles before, but you should totally head over to the McSweeney's website to check out the pinball articles by Mark Walters. They are hilarious and well written, and Walters gives lots of in-depth information about each pinball machine that he plays. I have also added a link to these on the right side-bar under "Pinheads" so that you can easily check back in (sadly there is no RSS feed for the entries). We can only hope these will someday be collected into a book! Nate Beaty's WRJ Dream Machine! 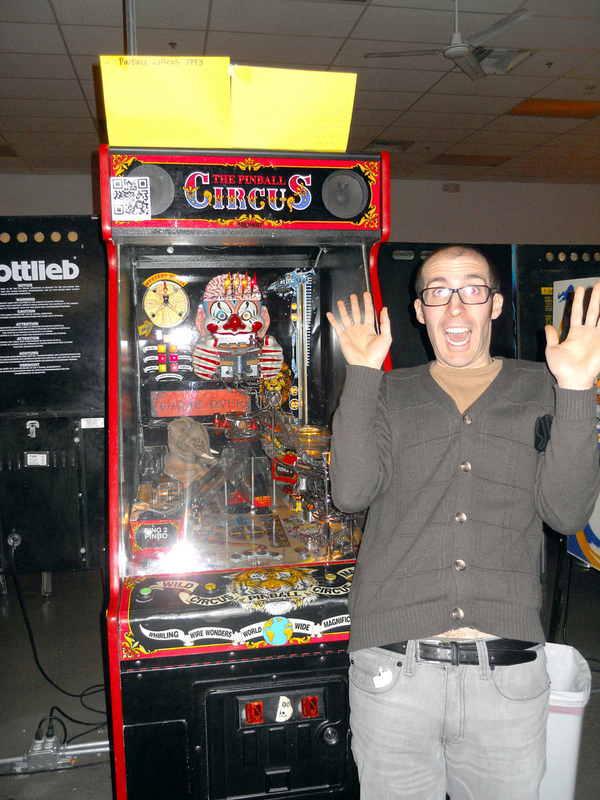 The next night we took Nate up to the bowling alley, where they had Scared Stiff and Last Action Hero. Nate had an amazing game on Scared Stiff, and was about one shot away from beating the entire board. It was a super fun night. 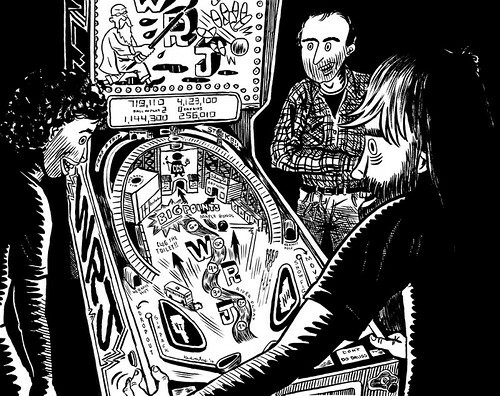 A few weeks later, Nate posted this illustration of me, Max and Jon playing a White River Junction themed Dream Machine! If you've ever been to White River Junction, you know that this illustration is LOADED with in-jokes. Note the slingshot covers are Vermont and New Hampshire, with the connecticut river running right down the middle. At the base of the ramps you can see a bus and a bowling lane (the bus station and bowling alley are both on top of the hill). The school where Jon and I teach, CCS, is right at the back of the playfield (awarding "BIG POINTS" - a wink at Nate's favorite line from the T2 pin) and the outbound lanes are labeled "Drop Out" and "Move." You can even see the school's mascot, Inky Solomon battling some bowling pins on the backglass! You can check out more of Nate's awesome illustration work and photography on his website. We've been getting tons of emails about a recent post on the Fantagraphics blog, all about a custom made FRANK Backglass, drawn by cartoonist Jim Woodring. 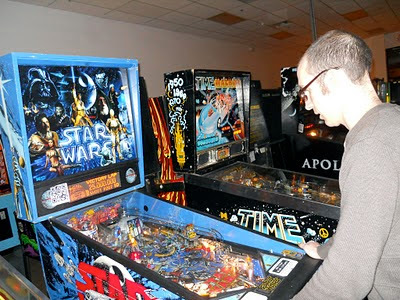 Comics and pinball? Now, that's right up our alley! A guy named Eli Curtz had this backglass made by Classic Playfield Reproductions. Check out their site to read all about their process of making this backglass. It also looks like Mr. Curtz has an additional 25 copies of the backglass, which he is selling for $200 each. 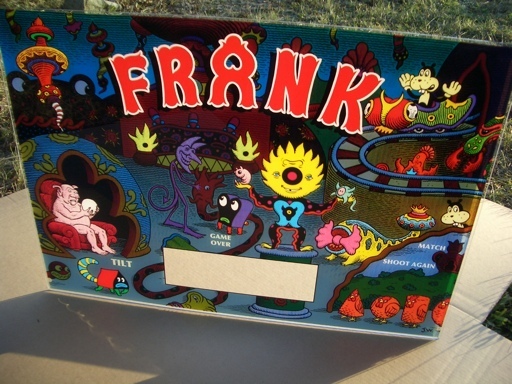 You can get ordering information on his Frank: Homebrew Pinball Machine page - it looks like he's going to build the whole thing!